On January 15, at the Okinawa Prefectural Government offices, students became enthused about their upcoming international exchange activities. The Okinawa Prefecture Board of Education has launched a project to send high school students engaged in arts and cultural activities to Singapore in February, and then to Shanghai in March, in order to deepen cultural exchanges with young people in those cities. On January 15, the board held a send-off ceremony in the Okinawa Prefectural Government offices, in which the students who will participate in the project performed the acts that they will perform overseas. The board has selected a total of 73 students on this occasion. 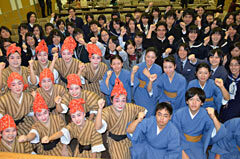 At the ceremony, students belonging to the Music Division played the saxophone and others of the Local Performing Arts group performed the Ryukyuan dance Yotsudake.